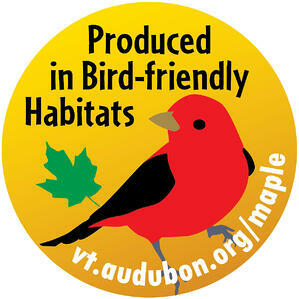 Spring is sugaring season in Vermont and this year that means Audubon Vermont's Bird-Friendly Maple project seems to be in the news everywhere. "Bird-friendly maple certification catches on with producers" was the lead on CBS-affiliate WCAX-TV Channel 3 News on April 2nd. Adam Sullivan talked with long-time maple producers in the Buck family as well as Steve Hagenbuch, manager of the BFM program, about their partnership to protect the sugarbush as a habitat for birds while producing award-winning maple syrup. Civil Eats and the Addison County Independent also covered the increase in the maple producers and sugarbush acreage involved in the Bird-Friendly Maple program. Meanwhile the Bennington Banner, VTDigger and others covered the news that the High Meadows Fund awarded $39,176 to Audubon Vermont to expand its Bird Friendly Maple program. The award will help to recognize and support maple producers who have agreed to manage their sugarbushes with practices that promote bird habitat. Audubon will also help design an efficacy study to assess the actual benefits to the targeted bird communities.